As my time comes to an end here at the Fair Trade Group Nepal, and Kathmandu, I find myself feeling incredibly lucky. Having this opportunity to volunteer with the Leave For Change program has been amazing – but more than that, the people I have been working with in Nepal have been absolutely fantastic. Being able to share, collaborate and work with FTG Nepal and Uniterra has been a privilege that I will always remember and I will always cherish. I think happiness is mostly about finding ways to share – share a story, share great food, share an idea, share time…to connect with another person and to experience something in common is what makes me smile, what makes me happy. I think the opportunity to give is itself a gift – to have enough to give, to have time and energy and interest to give is a gift that I deeply appreciate. So, I’ve been a smiling fool for most this trip, because I’ve been so happy. All day, everyday I get to share – stories and food and ideas and time. This has been a wonderful, and very productive trip. And this week, I had a very special opportunity to share. When I first read about the Leave For Change program, I was able to share some of the experiences of the first people to participate in the Leave For Change, which are posted on the Uniterra website. One volunteer shared how he donated his laptop at the end of his leave; I thought this was a great idea and I realized that I had the chance to share more than my time and experience with the Fair Trade Group Nepal. Shortly before I left for Nepal, I spent some time fund raising for FTG Nepal to bring them resources that I would be able to donate and leave with them. I was able to be in touch with FTG Nepal and Uniterra Nepal by email and was even able to get a sense of what they needed and what would be good choices. With this in mind I approached Onward Computers in Guelph about the possibility of donating a laptop for my use during the trip and to be donated to FTG Nepal. They were very supportive and were able to quickly come back to me with great news: they had a Toshiba Satellite Pro which they could donate. Having a solid foundation for my fund raising, I then (once again) went to my many generous colleagues at the University of Guelph campus and my friends and family and asked them if they would be interested making a contribution toward this project. They answer was a resounding yes, and we were able to raise more than $700 CDN. I also received a donation of a web camera! 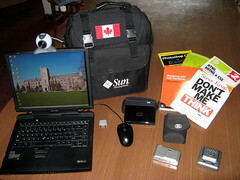 To this I added a laptop bag that was conference schwag from Sun (thanks Sun!) and a couple of core theory books for web design from my library: Jeffery Zeldman’s bible of the how to build a better web: Designing with Web Standards and Steve Krug’s masterpiece on web usability Don’t Make Me Think. FTG Nepal did not know about this donation, until this week. In fact, I was intending to wait until my last day, but when they started asking about photocopying my books before I left and realized I wasn’t going to be able to wait that long FTG Nepal very surprised and very grateful for these new resources. They have repeatedly thanked me – and each time they do, I tell them that all I did was ask my colleagues, friends and family to make a contribution, and that the people that really made this happen were the more than fifty people that chose to share what they have with this very worthy organization. So now it is time for me to say thank you to all the people who so generously contributed to this project so that we could make this wonderful donation. Thank you to the great community at the University of Guelph, and to all my friends and my family. Thank you for sharing with me and for sharing with the Fair Trade Group Nepal.